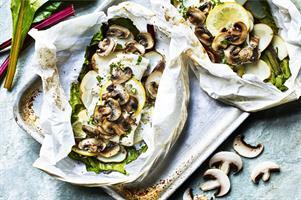 Take 2 large pieces of non-stick parchment paper. Towards one end place a little bed of the sliced new potatoes, top with the rainbow chard, cod, chopped parley, mushrooms and finally the lemon. Dot with the butter, add a splash of white wine and a little salt and milled pepper. Brush water around the parchment paper, fold over to cover all the ingredients, crimp the edge (like a Cornish pasty) brush to top of the paper with water and place into a pre-heated oven 180*c for about 20-25 minutes. Serve straight away in the paper.